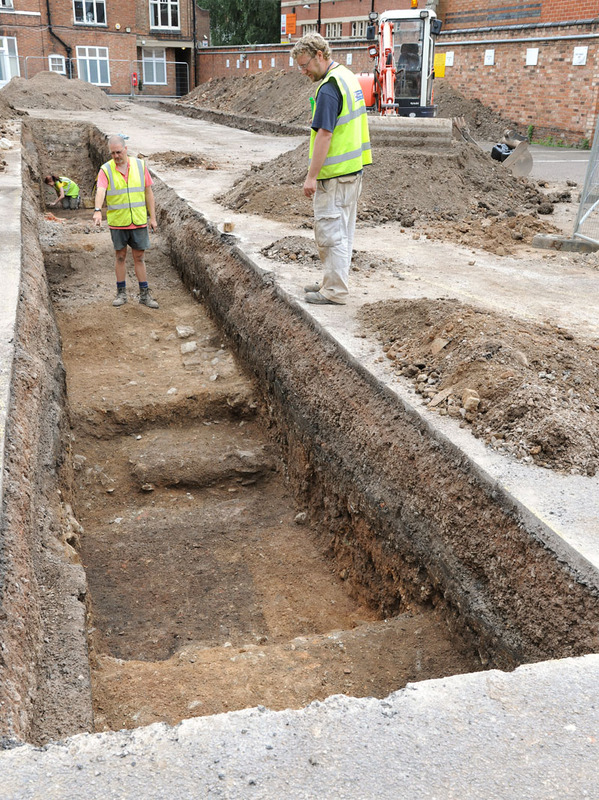 If it seems a stroke of incredible good fortune that ULAS’ trial trenches came down on the very features that were needed to lead archaeologists to Greyfriars’ church – according to historical documents, the burial place of Richard III – the story of how the structure’s remains managed to survive 500 years while the site was completely transformed around it is no less remarkable. Although the church was completely demolished following the suppression of the friary in 1538, the site seems to have escaped being built over until the early 17th century, when the land was bought by Alderman Robert Herrick, former mayor of Leicester. Herrick built a large mansion house on the site, probably converting some of the friary’s secular buildings in the process, but luckily the area containing the ruined church was turned into gardens. 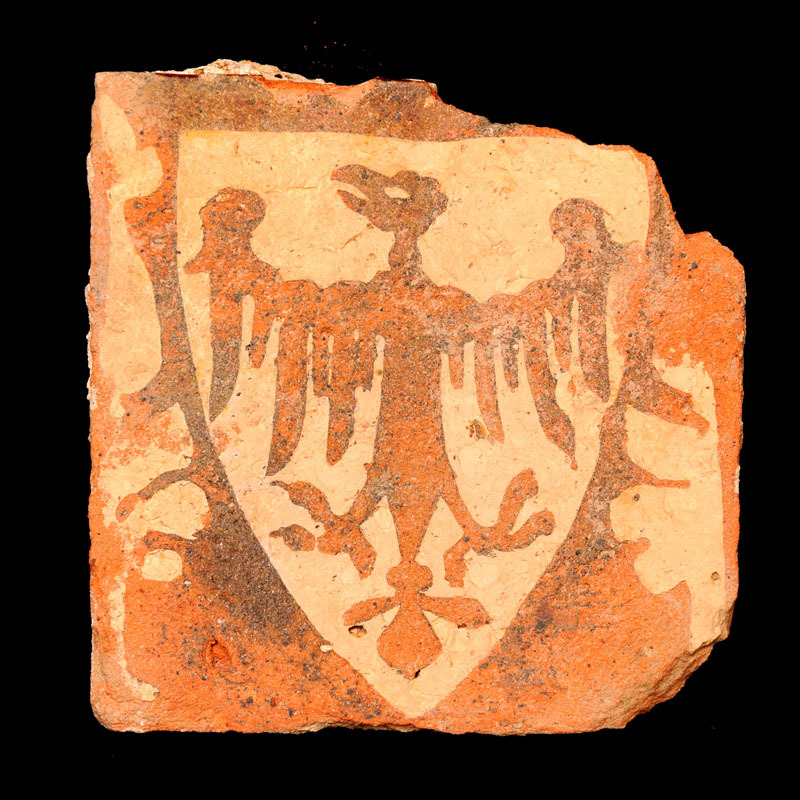 During thei recent excavation in the carpark, close to the church ULAS found an area of reused Medieval floor tiles of various sizes, possibly one of the paths from Herrick’s garden. This part of the site’s history is also where we get our last reference to the location of Richard III’s grave. Christopher Wren – Dean of Windsor and father of the famous architect of St Paul’s (see CA 266) – wrote a memorandum recording a visit to Herrick’s mansion in 1612. While walking in the garden with its proud owner, Wren describes being shown ‘a handsome stone pillar, three foot high’, erected by the alderman, which bore the inscription ‘Here lies the body of Richard III, sometime King of England.’ This marker has since disappeared. The mansion was demolished in 1870 to make way for a new street of genteel townhouses, but crucially the church area remained gardens during this development. When the site was transformed once more in the 1930s-1940s with the construction of the City Council buildings, this open space was simply covered over to create a carpark for the councillors. As a result, although most of the friary’s major buildings have disappeared beneath modern urban redevelopment, the remains of the all-important religious structures – cloister, chapter house and church – were protected beneath a layer of tarmac, waiting to be uncovered once more. We will be running the full story on this discovery in CA 272 – out 2 October!